Posted by smallmeasuresbigpleasures in Recipes, T.G.I.F...Thank God Its FRY Day! Its actually a great challenge that I have taken up… T.G.FRY.DAY!. Coz its extremely difficult to come up with something that’s tasty, healthy, nutritious (despite being fried) and most importantly appeals to kids. After putting in a lot of thought into the all the factors mentioned above, i came up with this recipe….Hope your kids enjoy it as much as mine did! Boil two cups of water in a pot, remove from flame and soak the soya chunks for about 10 minutes. Now drain the excess water and squeeze the chunks gently to get rid of the remaining water. The soya chunks obtained would be nice and soft. Take a bowl, put in the soya chunks and add half teaspoon turmeric along with salt to taste. Allow to marinate for another 5-7 minutes. Now in another bowl, mix gram flour, half teaspoon turmeric, red chilli powder (optional), asafoetida and salt to taste. Slowly pour in water to get a slightly running consistency batter (similar to that of tempura mix. Too runny batter would not coat well and too thick batter would not cook well). Place oil for frying in a frying pan and heat on medium flame. Roll the marinated soya chunks in the batter and fry till golden in colour. Place the prepared pops on a kitchen towel to absorb excess oil. The soya pops are now ready. Cover the egg plant completely with aluminium foil. On a serving plate spread fresh coriander and place the silver egg plant. Insert two pops in each toothpick (approx 10-12) and then insert them on the silver egg plant as shown in the picture. 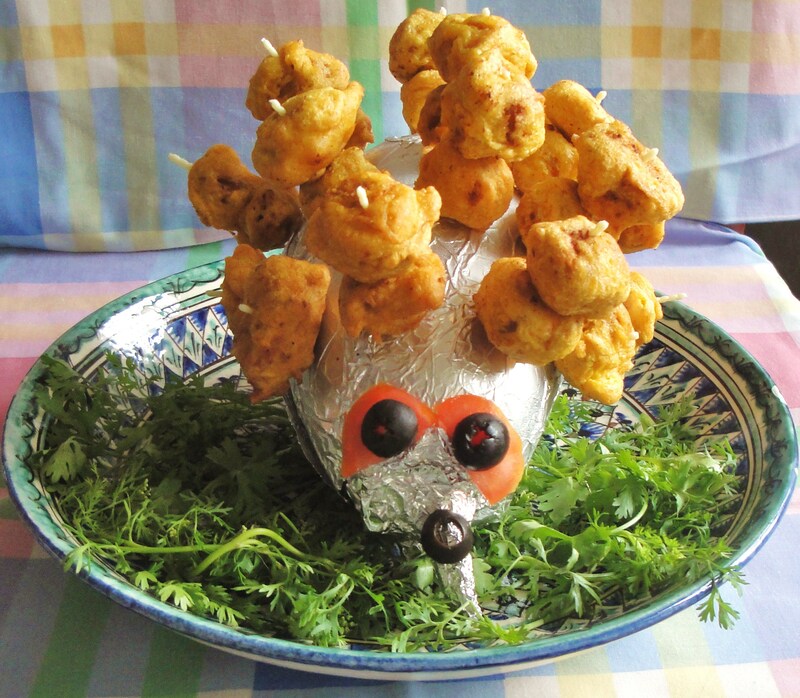 Make the eyes of the hedgehog with tomato and black olives. 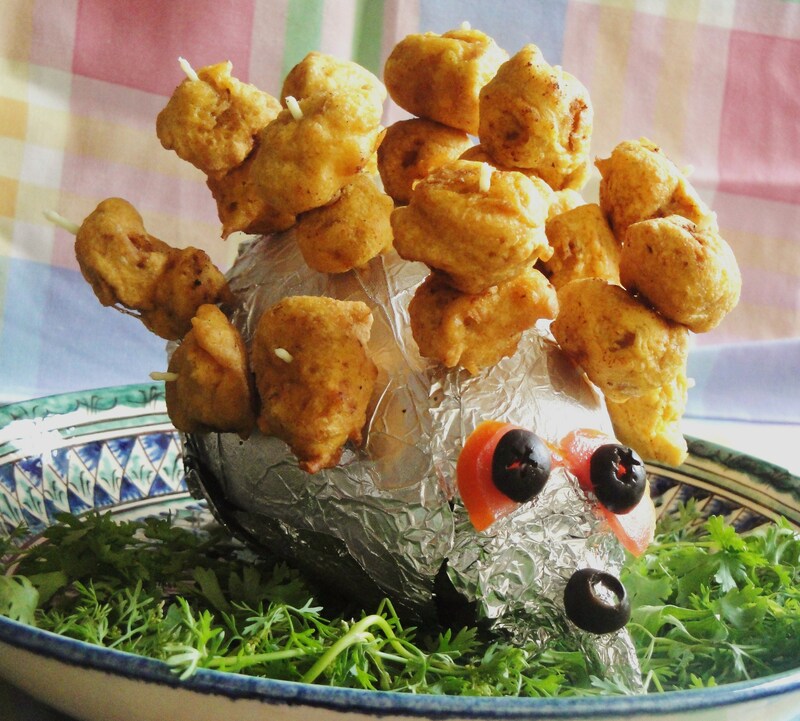 The soya hedgehog is ready. Serve immediately. 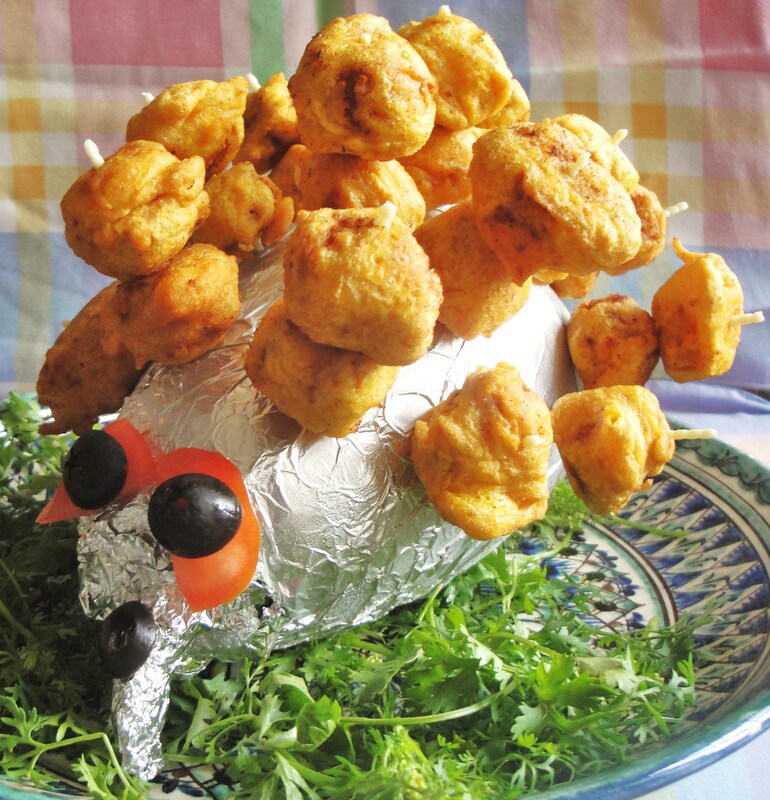 Kiddie Tip: Serve it with mint sauce or tomato ketchup. You may also sprinkle some chaat masala for an extra punch. Thanks for sharing your thought . I’m glad you liked it. Do keep visiting for more interesting kids recipes. You have so many cute ideas on your blog! I am going to try one with my children! Thank you so much for your comment. Please do try, and let me know what your kids had to say. 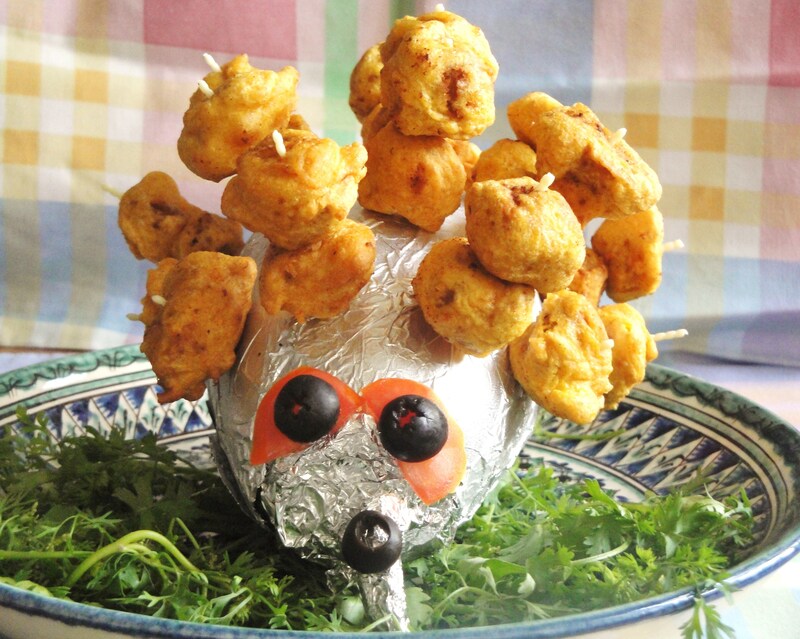 Do keep visiting for more interesting kids recipes.